News - Another Level planning a reunion? Another Level planning a reunion? The 90s R 'n' B group - Dane, Mark Baron, Bobak Kianoush and Wayne Williams - are said to be interested in getting back together to appear on hit ITV2 show The Big reunion, according to The Sun. 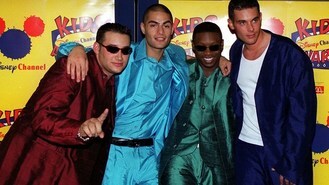 The band rose to fame in 1997 and had a number one with single Freak Me. But the band fell apart when Wayne quit in 1999, claiming the other lads weren't working as a team. And Bobak swiftly followed, leaving Dane and Mark to try and make it as a duo, before calling it quits in 2000. Sources say the lads are keen to make a go of it again, but there will be tension in the group because of the way Wayne and Bobak left. Other acts thought to be in talks to reunite for the show include Eternal and S Club 7.